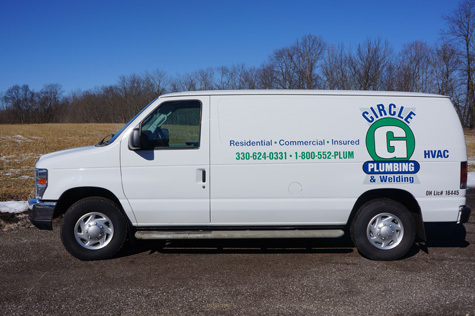 Burbank, OH Plumbing, Heating & Air Conditioning | Circle G Plumbing & Heating Inc.
At Circle G Plumbing, Heating and Cooling, we provide an excellent range of plumbing and HVAC services in Burbank, OH, including installation, repair, replacement and routine maintenance. We understand how important it is to keep your plumbing as well as your heating and cooling systems in good working order at all times. After all, many of the modern conveniences that we take for granted ultimately depend on the integrity of the pipes, fixtures and appliances that comprise your plumbing, as well as that of the furnace or central air conditioner that comprise your HVAC system. When you deal with the certified Burbank, OH plumbing and HVAC service technicians here at Circle G Plumbing, Heating and Cooling, you can rest assured that the job is done correctly the first time. When it comes to keeping yourself and your family comfortable, you need to hire a professional. We employ only certified and hard–working technicians who believe in customer satisfaction as much as we do. Whether your sewer line is busted or your heater needs to be replaced, we can be there in no time to evaluate the issue and provide you with a solution. For comprehensive plumbing, heating, and air conditioning in Burbank, OH, you should consider our team. Call Circle G Plumbing, Heating and Cooling today for more information about what we can do, or to schedule service. The Burbank, OH HVAC and plumbing experts at Circle G Plumbing, Heating and Cooling offer quality repair, installation, and maintenance services throughout the Burbank area. Do you have a leak or clog? Has your water pressure decreased gradually over the last month or so? Do you need a new water heater? At Circle G Plumbing, Heating and Cooling, we provide professional plumbing services throughout the Burbank, OH area, including the installation of new piping and fixtures as well as the replacement of your old equipment that no longer functions as it should. Our Burbank, OH plumbers can also take care of any plumbing repair or maintenance needs that your home may require. Let us solve your plumbing issue quickly. When it comes to keeping warm during the Burbank, OH winter, you need a decent heater. We can make certain that your home has a powerful, appropriately sized and efficient heating system so that you stay warm throughout the cold season. We can create customized sheet metal ductwork so that your new heater works exactly as it should. If your existing heater no longer functions as it should, then you may want to consider our Burbank, OH heating systems service. We can assess the issue and present you with a detailed solution. During the summer months, when heat and humidity rise and cause discomfort inside the home, you need to have a cooling solution at your fingertips. At Circle G Plumbing, Heating and Cooling, we provide complete air conditioning services throughout the Burbank, OH area, including installation, replacement, repair and maintenance. Whether you need a new central air unit for your home or your existing AC needs a new capacitor, our Burbank, OH air conditioning technicians are skilled and ready to get to work. Call us today to learn more about our professional air conditioning services in Burbank, OH.